Wolves manager Glenn Hoddle is unlikely to pursue his interest in Dundee United defender Mark Wilson. Hoddle made enquiries during the summer and that was followed by a recent call from United boss Gordon Chisholm. But Hoddle told the club website: "When we played a pre-season tournament in Dundee, I asked to be kept informed. "I'm surprised this has come out now because Gordon called me four or five weeks ago about the lad. I said I would call back if I wanted to act on it." The 21-year-old has also been linked with Celtic and Leeds, while Hearts are interested in the attacking full-back. Wilson's former representatives Sportstar told BBC Scotland there had been a recent "genuine and active enquiry from Hearts". They said Hearts, who refused to comment, were "mulling over a move". Under the terms of Wilson's deal, he is entitled to talk to any club who put an offer of £500,000 on the table. 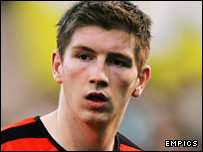 However he is contracted to the Tannadice club until 2008. Sportstar represented the player until recently and received the approach from Hearts. "If anyone came in with less than £500,000, I wouldn't even bother looking at it," United chairman Eddie Thompson told the Scottish Daily Express. "We rate him highly and have a powerful hand because of his contract."